If any of you happened to miss the Big Brother 2014 episode on Sunday night then you missed the new intro video for Big Brother 16 and I am digging it! They put a new splash to it and I want you all to see it and tell me what you think! Check out the Big Brother 16 intro video below in my Big Brother 2014 spoilers! There have been mixed reviews for this new intro, but I am liking it. I noticed it right away during Sunday’s episode, since CBS could finally premiere it now that all 16 HouseGuests were moved into the house. I am intrigued to see how they work it, since they normally remove the face of each HG once they are eliminated. Will they be making this intro video super short by the time the Big Brother 2014 finale comes around? Join us tonight on Big Big Brother for our Big Brother 2014 Live Recap. 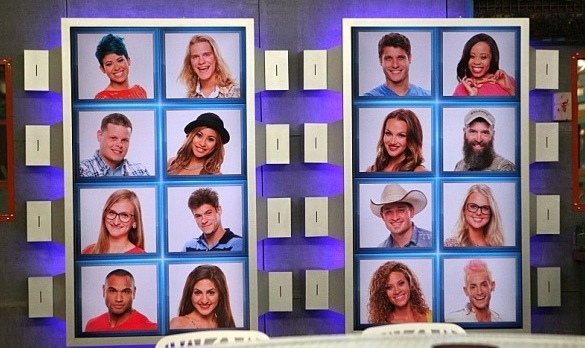 Let’s watch together and see who won Power of Veto on Big Brother 16 tonight! Find us on Twitter and keep up with us on Facebook. Don’t forget Big Brother 16 live feeds for even more Big Brother fun, but uncensored! Every sign up helps support this site to keep bringing you Big Brother 2014 spoilers, news and gossip all season long. I really like the new memory wall. But i hate the new intro. The old one suggested secrecy and spying with the Big Brother “eye” at the end. This one just represents summer fun and no intrigue to it. Reason: Don’t mess with Cats! I like the memory wall and the new intro. The new key draw however, I do not like. I like it when they went around the table and pulled keys and the ones with no key were up. I don’t like the new key draw either. Maybe just have to get used to it? Doing A-OK Thanks for asking. How about you? Planning to watch tonight? Indeed lady, if hubby don’t get me into something. I just hope I don’t fall asleep – I didn’t have a very good sleep last night and if things don’t pick up, it’s going to be hard to stay awake. I hear you Mary, it is pretty boring right now. I miss the old key draw also. But with 2 HOHs it would take up a bit of time for each person to draw a key. At least until they got down to fewer house guests. I agree with Cat about the “big brother’s watching” should still be there. I do like the creativity of the water. I just wish they could come up with a few more motions so they don’t all look like they’re doing the same arm motions. They just need to pop the eye in there at the end and that will be fixed. Somebody call Julie. One down one to go. Todd I had to find this one on Google, why am I now not getting your posts. I like the wall but indifferent about the intro. Looking forward to tonight. I hope everyone has a great July 4th holiday. You to Jon if you are traveling be safe. Well I guess no one new to pop in today on us like kasha shenanigans, had yesterday. Wonder where she went? I think things aren’t going to pick up here until things pick up on the show, Carol. I emailed our friend “Tessa” too, to get her on board. But I haven’t heard back from her. I hope she joins us Lilly, I love reading all the comments. And enjoy everyone on here so far. Things are picked up here. Cat is scratching everyone! Oh oh, now she is going to get me good. Oh well that is what BB does to your mind. I will pay the royalty! Sing it! Ewwwwww…..ok i take it back. Cat scratch fever is O-U-T!!! Good morning Tbird. We do not want to see Amanda ever again. Have a great 4th everyone. Good Morning. I love me some Team Donny. Hi all I hope you each have a wonderful and safe 4th. The show is getting interesting. GM, Carol. Are you cutting out on us a day early for the holiday weekend?! Good morning Lilly. I hope they let us go at noon, but since I work from home I am not doing much today. Most of my clients are off all week, that is when they take their vacations and close the business for the week. Yea, I’m cutting out here early today with some comp time I need to use anyway. But I won’t be far from my laptop at home this weekend! The first week of BBAD, and I’m already bleary-eyed here at work!! I know what you mean. I really feel bad for Donny on how Devin is treating him. I hope Devin or Caleb goes home next. i HATE the new intro… very cheesy and very The Hills-esque… i dont get it..